I've been on a jersey roll lately! I did a Major League Soccer jersey ranking a few years ago, but it's time for a new one, especially when everyone's jersey is lightyears ahead of where they were last time I did this list. The MLS season started this past weekend, so there's no better time to rank the league's uniforms for the year. MLS has acknowledged jersey enthusiasts this year, with their first-ever "Jersey Week" revealing all the new kits for the season. Adidas does a great job with its MLS uniforms, so even the "worst" jerseys on this list look great compared to many teams around the world. So let's get started! 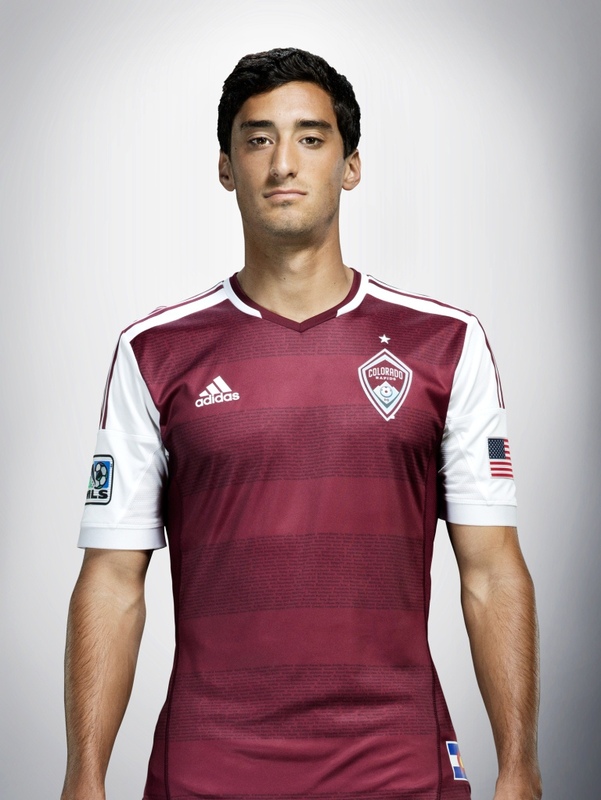 Note: there's a new number/name font for the back of MLS jerseys this year. It's a big improvement over the last one. It breaks my heart to put Portland dead last. The last two seasons they wore perhaps my all-time favorite Major League Soccer kits. It's as if they didn't really know how to improve upon perfection, so they just went for a huge downgrade. Both their home and away jerseys look very similar to their last set, but with unnecessary changes. I guess that's the real shame of the soccer world's constant jersey turnover cycle. Why do they need those arbitrary white stripes on the sides? Why do they need that sci-fi triangle collar thing? That Portland city flag near the waist is nice, but why does it need to be in the shape of Oregon? Isn't that a bit redundant? 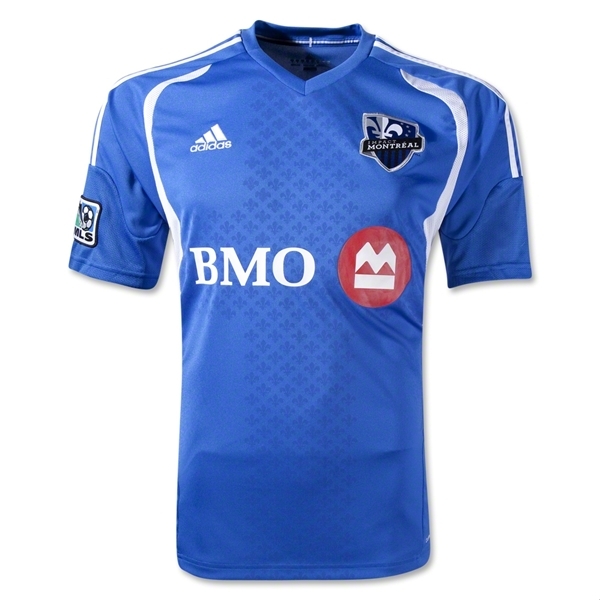 It's a shame that a team with such an iconic French-Canadian identity to capitalize on has such a lackluster uniform for its first couple years in MLS. Yes, they wear blue and white and they feature the fleur-de-lis everywhere, but I can't help but feel that their shirts look like practice jerseys. And really, "Montréal Impact"? I still can't get over the fact that their team name is incredibly 1990s. But there's hope! Last week the club unveiled their new third jersey, and it's a work of art. The Inter Milan-style blue-and-black stripes are timeless. One can only hope a shirt like this eventually becomes their home jersey. 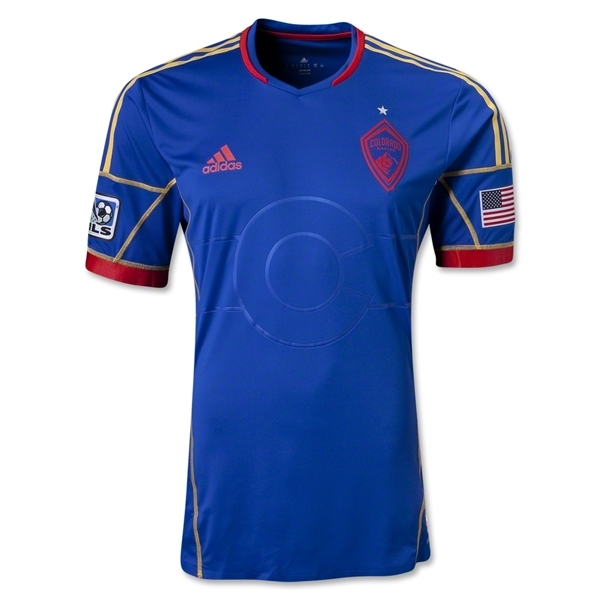 Real Salt Lake is yet another team with wasted potential in their current uniforms. 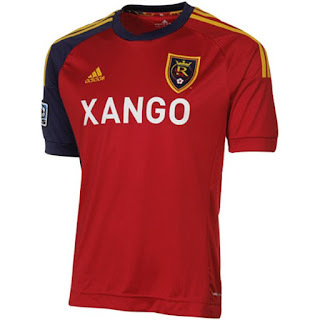 Their color scheme is unique among North American clubs, and despite the dumb faux-Spanish team name RSL has has established a real identity both in the league and within their local Utah market. Why do they need that strange off-colored sleeve design? It serves no purpose except to be different for difference's sake. But hey, at least that XANGO logo looks nifty. Another team with a big jersey downgrade from last season. They had retro-style shirts with nice little collars, and now they just have... orange shirts. They even lost the shirt sponsor they had last season. With arbitrary white parts on the sleeves. They were very proud to reveal that the new kits have the team's Incredibly Meaningful Slogan "FOREVER ORANGE" in an awkward spot on the collarbone part of the shirt. I just don't get the point. But the colors are still good, and the lil Texas flag in the corner is nice. And Houston's deep orange pinstriped third jersey is still great. They should wear that full-time at home. 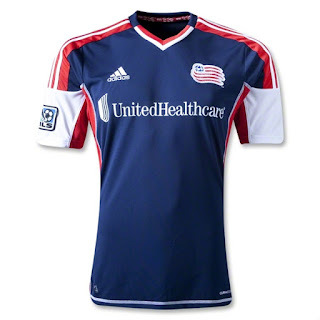 One of the original MLS clubs, the New England Revolution still sport a name and identity straight out of 1996. Their current kits are probably the best they've ever had, but that's not saying much. The best thing I can say about these is... "unremarkable." There's nothing wrong with this shirt, it just doesn't stand out at all. As we've seen with Sporting Kansas City (née Kansas City Wizards), some of the original MLS teams could benefit from a brand reinvention--both in terms of establishing a better look, and in terms of building a bigger fanbase. The Revolution could use a revolution of their own. 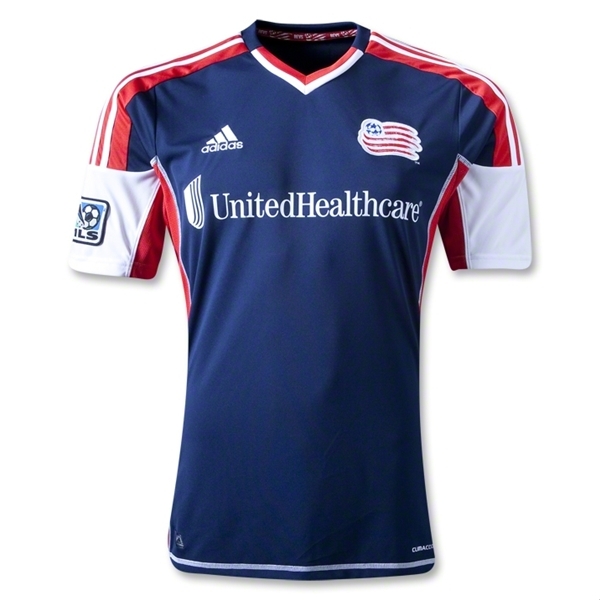 One nice touch is the Revolutionary War flag of New England on the back of the shirt. I'm a sucker for flags. For a city known for its bright, somewhat gaudy jersey colors, this one isn't especially noteworthy. 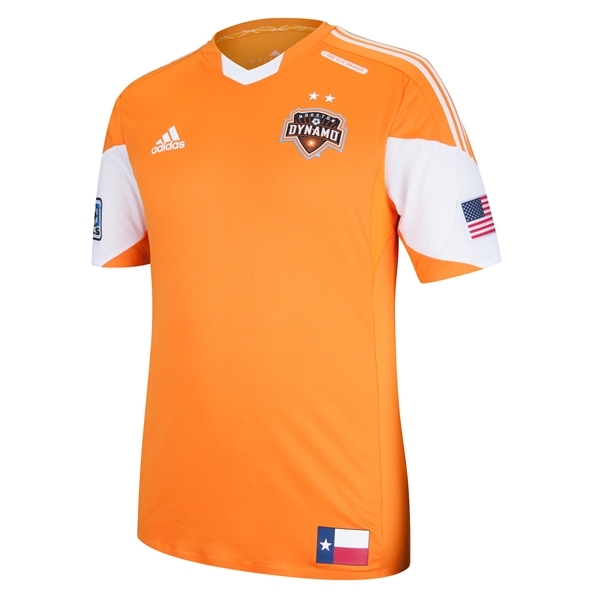 I feel mostly the same way about this one as I do about Houston's bland orange shirt. 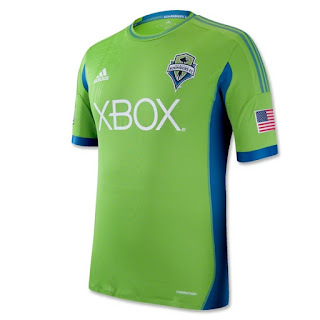 But this is a substantial upgrade from Seattle's "silver backpack straps" jersey last year. It's a bummer, because other than the backpack straps, last year's shirt was superior. But oh god, those backpack straps. And Seattle has an A+ color scheme and crest. It's also unfortunate that this team known for bright colors has chosen once again to go with a black away jersey. 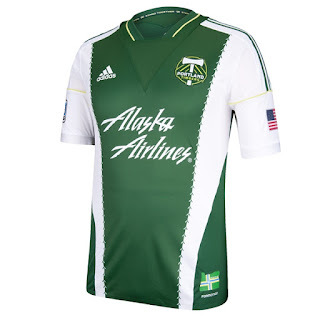 It's a decent design, but they've gone crazy on their secondary kits in the past, so why not do it again? 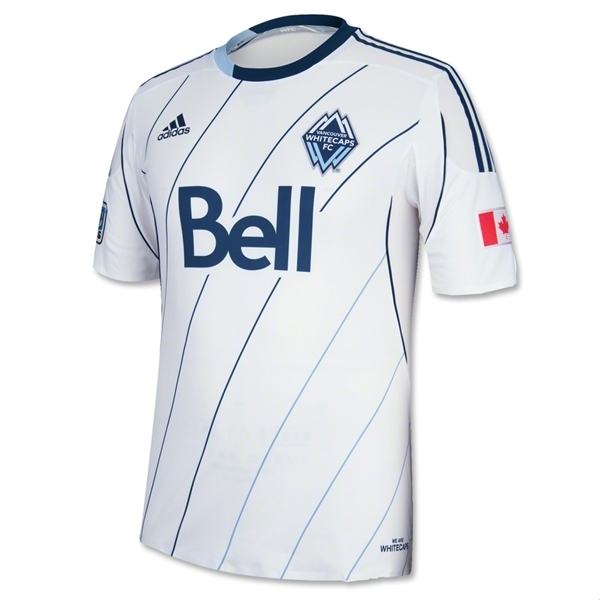 Vancouver's jersey last year was one of my favorites in the league. Sensing a common theme here? Without really anywhere to go, the team decided to arbitrarily go with diagonal pinstripes instead of the horizontal ones they had before (are they called pinstripes if they're not vertical? I don't know). They also made the colors on the collar strange and off-center. Neither of these additions seem like anything that will become part of the team's permanent identity--I'd be willing to bet their next jersey after this won't have an off-center collar or little diagonal stripes. They just seem frivolous. What we get is a well-designed jersey that's still a slight step backwards for the team. The diagonal stripes are reminiscent of Adidas' current jersey for the German national team, and that's not necessarily a bad thing. 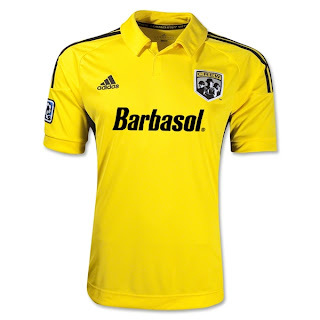 This is probably the best kit Columbus has ever had. Bright yellow always risks being gaudy, but the collar and striping help it look a bit more classy than your average bright yellow jersey. But I still think they should wear black shorts. The all-yellow look makes the team look super goofy. They look better on the occasions when their shorts are black, to give a little contrast. 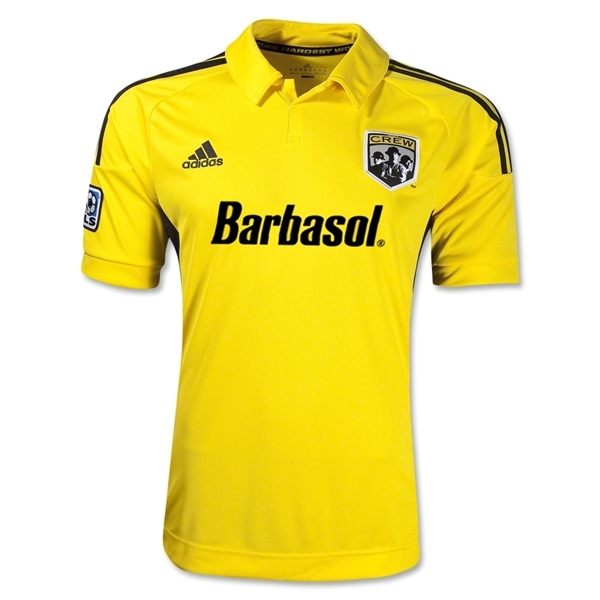 I normally disregard sponsor logos, but there's something inexplicably hilarious about Barbasol sponsoring a professional sports team. I love it. However, I still wish the team would change its cheesy name or at least its Hunky Construction Worker Calendar logo. 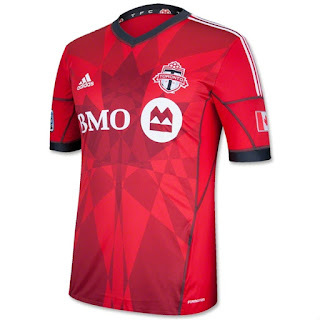 Toronto has a fitting identity as Canada's first Major League Soccer club. Their colors, crest, and uniform all do a good job of reflecting the city. My biggest issue with this jersey is the strange maple leaf pattern on the chest. The Adidas PR guy says it's meant to represent that Canada (and the team) is made up of people from all walks of life, so there are all these different gray lines working together to form the maple leaf. Adidas loves doing these sort of patterns on jerseys, but usually they're a bit more subtle than this. See the cross made of fleurs-de-lis on Montréal's shirt up at the top of this article? That's how it's done well: from far away and on TV you can't see it at all, but once you get close you can see it and think "neato!" This maple leaf design on Toronto's jersey is just a bit too much. And when you see a human wearing it, it just looks like they're really sweaty. After an incredibly bland debut jersey as the rebranded Sporting Kansas City, the team makes a slightly bolder move with this one. My opinion on it is torn. On one hand I think it looks too '90s, and reminds me of Real Salt Lake's arbitrary off-color sleeve seen earlier in this list. 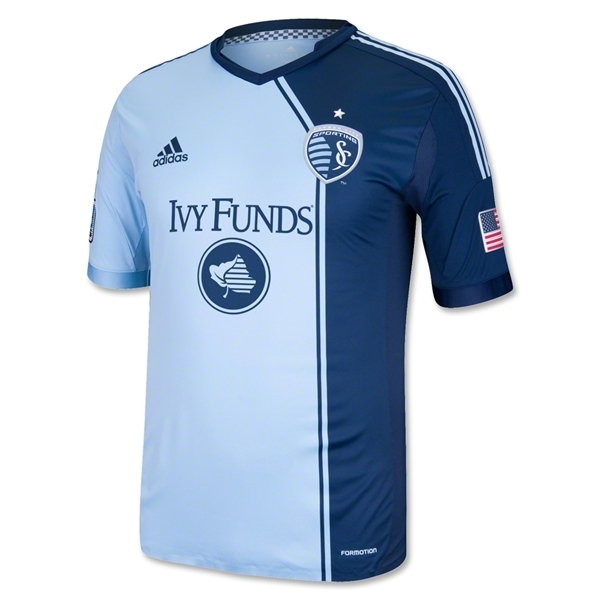 But on the other hand, it gives Sporting KC a unique identity. The split light/dark blue shading is meant to reflect the Kansas/Missouri state line, since the city exists in two states. The club plays its home games in Kansas City, Kansas, so as a resident of Kansas City, Missouri, I'm glad they're acknowledging this... although I'd argue the Missouri side is the only real Kansas City. The Kansas side is a mere suburb! But that's a debate for another time. Speaking of goofy sponsors, I love the Quaker Oats guy on this shirt. Other than that, this is a classy jersey all-around. Nice colors, nice stripe in the middle, nice collar. 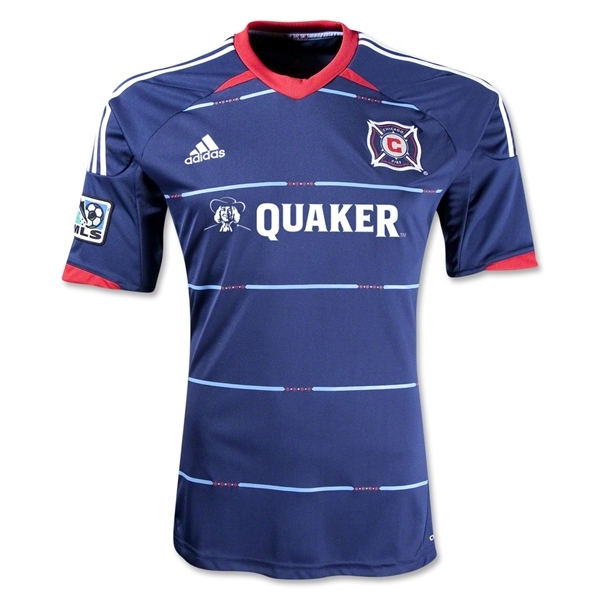 The blue away jersey has a nice striped pattern with the four red stars from the Chicago city flag. 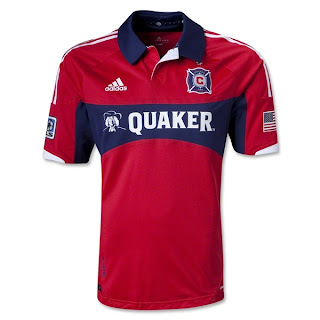 There's not much else to say about this jersey, but one can't help but feel that whatever Adidas designs for Chicago next will be an inevitable step down from this pleasing shirt. Despite Colorado having a nice color scheme, they've never really been able to forge a true look of their own. Their new home jersey isn't exactly exciting, but it's a nice design. The change everyone is talking about is the striping. 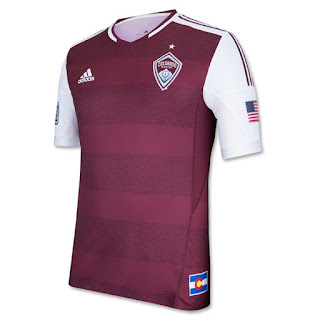 You think they're just standard hoops around the chest of the shirt, but you look closer and see that it's actually the names of every single Colorado Rapids season ticket holder. Nifty! Maybe it's because I'm from DC, but the season ticket holder wall of names reminds me a bit of the Vietnam Veterans Memorial. They don't look like happy names. But that's just one small quibble. Colorado's new away jersey is absolutely stunning, however. I'm a flag enthusiast, and the whole jersey is an adaptation of the Colorado state flag. It's perfectly designed and provides a great alternate color scheme for the team. This is how to design an away jersey. If this were an Away Jersey Rankings, Colorado would be #1 by far. 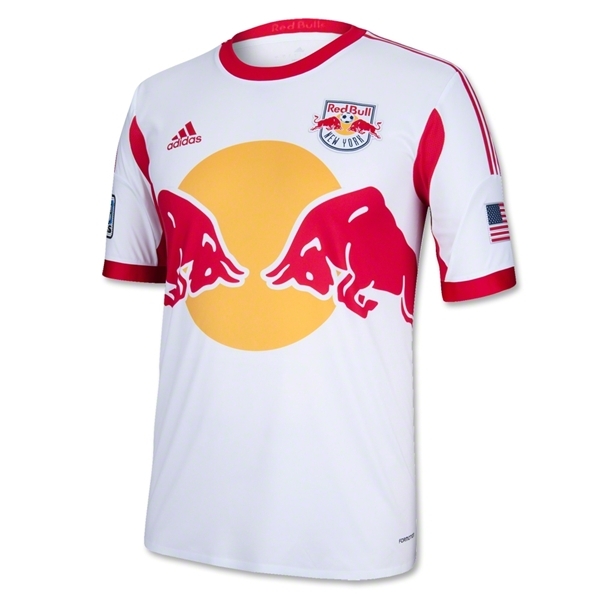 There's almost no change here from what Red Bull New York wore last season, but that's fine with me. If you take the whole Corporate Sponsor Naming Rights stigma out of it, the Red Bull logo is pretty awesome. So of course it's going to be a simple white and red jersey with a big ol' Red Bull logo. It's a bit redudant that the Red Bull logo appears in both the team crest and on the chest of the shirt, but oh well. Red Bull actually coordinates its jerseys between all five of the professional soccer teams it owns (and one pro hockey team) around the world: besides New York, there's FC (soccer) and EC (hockey) Red Bull Salzburg in Red Bull's home country of Austria, RB Leipzig in Germany, Red Bull Brasil in São Paulo, and Red Bull Ghana in southeast Ghana. All the jersey coordination is awesome--not to mention all the Formula One teams and other sporting events owned by Red Bull. As I wrote about in my U.S. Soccer jersey review, I love me some red and white hoops. FC Dallas does a great job of embracing its Texas über-state pride with these jerseys. The home shirt looks fantastic, and the blue-and-white striped away jersey is equally striking. It took me a while to warm up to this kit's multiple-width striping, but now I think I really enjoy it. 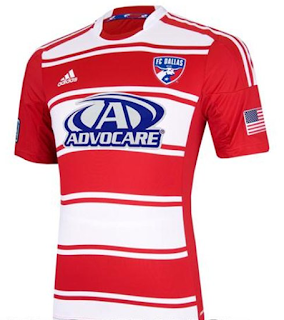 Although Houston may be the dominant Texas soccer team, Dallas is the better-looking club! There's only only issue I have with this jersey, as I do with nearly every striped jersey these days: the stripes don't continue onto the back. Instead, there's an ugly box on the back where the player number goes. This is done to make the number easier to read, but as some of Adidas' own designs show us, you can make numbers readable without sacrificing the stripes. Considering my outspoken distaste for unnecessarily black jerseys in my NHL jersey ranking post, I've even surprised myself with my love for San Jose's jersey. But it's just so fresh, so clean! 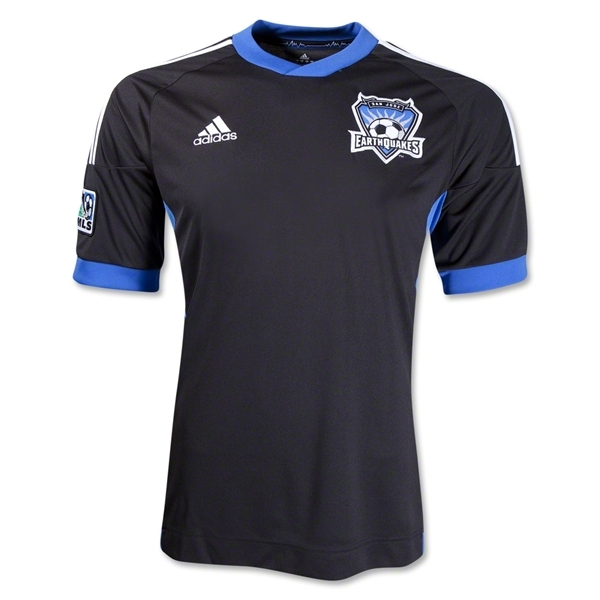 Despite San Jose having by far the worst team name in Major League Soccer, this simple black shirt oozes style. The no-frills design with fabulous blue cuffs makes me want to kiss it. It's the blue cuffs that make the whole thing pop. But much like California's hockey teams, I dislike the fact that the Earthquakes wear black. Of all places in the United States to wear bright colors, you'd think it'd be California. Not black. When I think California, I don't think grim. Especially when San Jose's secondary color is such a pleasing shade of blue. They should make this jersey their away jersey, and wear their gorgeous all-blue away jersey at home. Philadelphia was able to create one of the most unique identities in Major League Soccer while still retaining a traditional feel. The blue with the gold stripe down the middle looks great, and the light blue accents are the icing on the cake. The whole thing tickles my fancy as an homage to the flag of Philadelphia. The away jersey stands out as well, keeping the same basic design with a lighter color scheme. 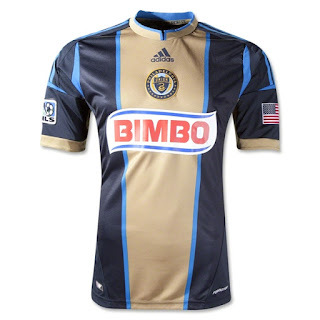 But the elephant in the room when it comes to Philadelphia's kits, of course, is BIMBO. The jersey sponsor is the biggest bread company in Mexico, and even sponsors the shirts of both of Mexico's biggest clubs. Whatever excuse they provide, though, the word "Bimbo" has different connotations in the English-speaking world. It doesn't help that the BIMBO color scheme clashes with the rest of the jersey. 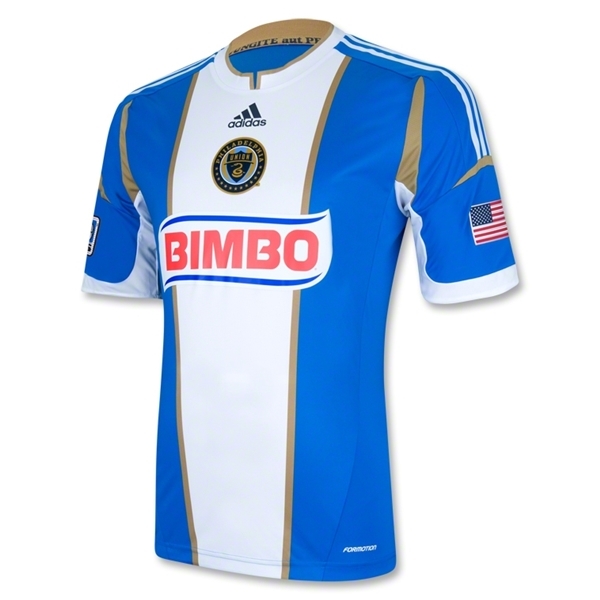 I wish they'd at least use the retro Bimbo logo used on Philadelphia's new third jersey. I can look past BIMBO, though, because this shirt is so nice. Major League Soccer wants the Los Angeles Galaxy to be the league's marquee club, and the jerseys certainly reflect that. The blue sash on white is a striking feature that seems to say "we're better than the rest of you." It looks futuristic and classic at the same time. All the minor piping and detailing on the jersey is in just the right places. A note about stars: traditionally, MLS Cup champions have worn the "Scudetto" patch on their jersey the following year, and then the next year add a star above their team logo. Last season the Galaxy were defending Cup champions so they wore the Scudetto, along with the two stars above their crest to indicate their two previous championships (for a total of three championships). But then they won again last season. Instead of wearing the Scudetto for a second year in a row and simply adding a third star above the crest (to indicate four championships) for this year, I guess they wanted to draw more attention to their fourth title. They stopped wearing the Scudetto and put all four stars above their crest, with the fourth one above the other three and in gold instead of the traditional silver. It looks a bit strange, since fellow four-star club D.C. United simply wear four stars in a row on their jersey (as you see later in this article). But maybe this will be the new practice for defending MLS Cup champions? A gold star above the rest of the stars on their jersey? I'm not sure I like it. Perhaps I'm just a giant homer. But unlike most other founding MLS clubs from the inaugural 1996 season, D.C. United has maintained a consistent identity for their entire existence. As the dominant force in the early years of the league, D.C. is the closest thing MLS has to the Montréal Canadiens (and they got a whole children's book about their jersey). When it comes to MLS history, D.C. United is it. The Black-and-Red wear more red than usual to spruce up their timeless black kits. 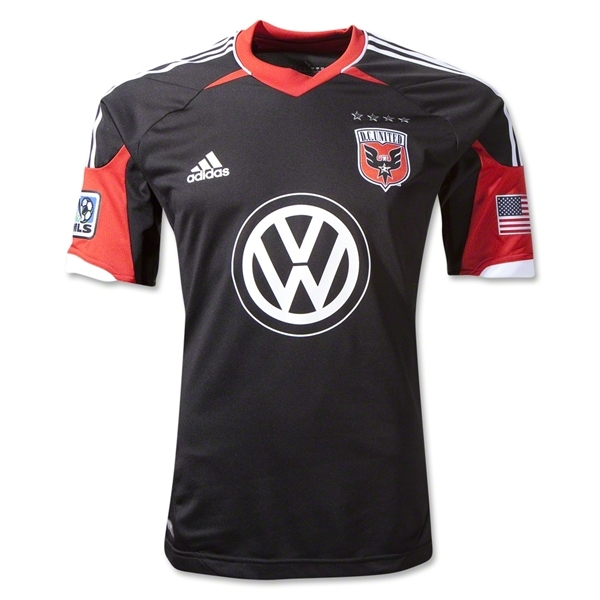 And unlike virtually every other sponsor logo, the Volkswagen emblem on the chest looks just as classy as the rest of the shirt. I only wish the D.C. flag on the waist would make its way to a more prominent space on the jersey, like above the player name on the back. It's a nice reminder that while the club continues to search for a new stadium, they're committed to staying in the District of Columbia. I feel dirty putting Chivas USA at the top of my list. They're a mediocre club owned by and named after the biggest, douchiest club in Mexico, and their new mission in 2013 is to exclude all non-Latinos from their team. But it's a perfect kit. The stripes are perfect. The collar is perfect. 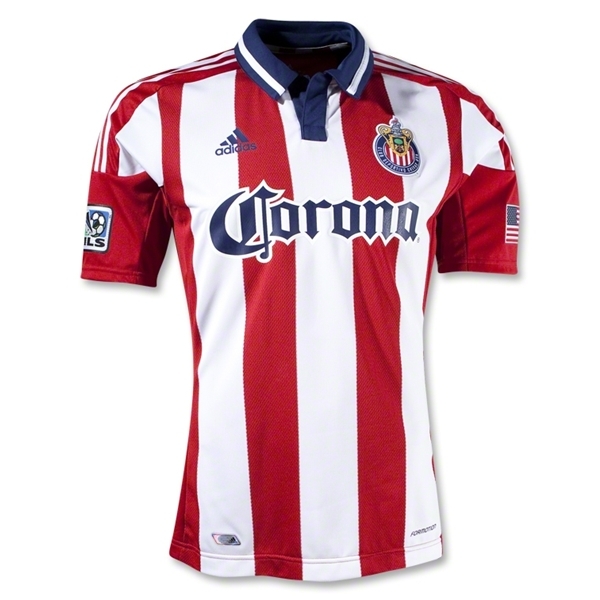 The Corona sponsor fits perfectly, as "America's Mexican team" is sponsored by the most widely-sold Mexican beer in America. Previously, I've complained that while the team crest is perfect as well, it's based on the logo of their parent club Chivas del Guadalajara, which is in turn based on the coat of arms of Guadalajara. 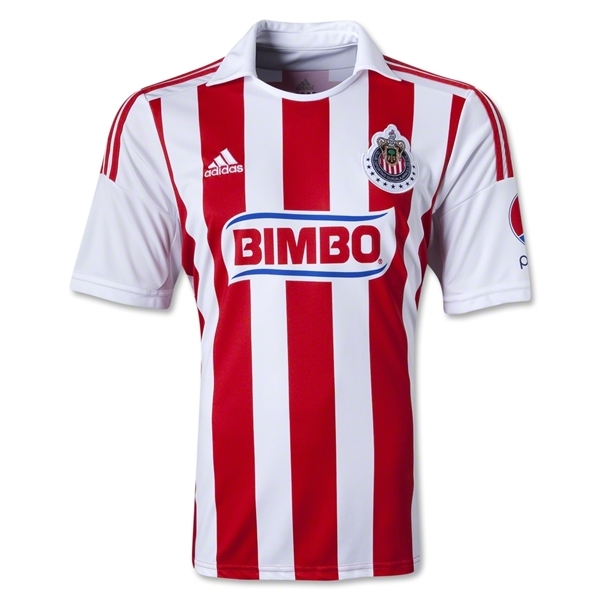 Chivas USA doesn't play in Guadalajara, so it doesn't fit. Instead, I've always said they should incorporate the awesome coat of arms of Los Angeles, the city where they play. 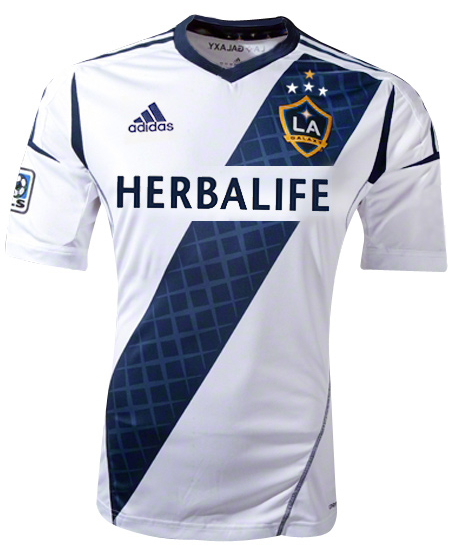 And then they revealed a new away jersey with the coat of arms of Los Angeles on the back. It's like they heard me. These are so great stuff in athletic apparel and Your work impresses me a lot.